Wiltshire Council rolled out the welcome mat for jobseekers with disabilities and recruiters at its annual EmployAbility Fair. 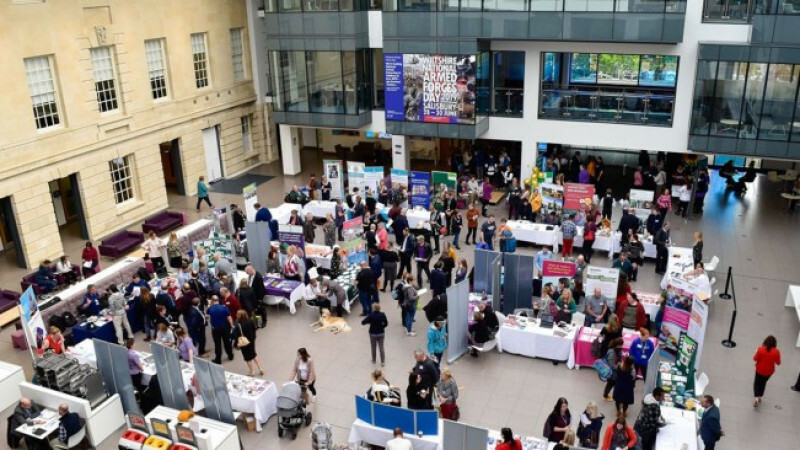 The event at County Hall, Trowbridge, attracted dozens of employers all eager to meet potential staff. Guests at the fair included the Conservative chairman of Wiltshire Council, Allison Bucknell; Baroness Scott of Bybrook, OBE, Conservative Leader of Wiltshire Council and Dr Andrew Murrison Conservative MP. I am happy to be here because I am the council's equalities champion, and it is such an important and incredibly helpful event for so many people. We are very proud of our commitment to equal opportunities for all our people, regardless of disability. I know personally how difficult it can be to get that first start into work. My daughter is disabled and works, but at first it can be difficult while you are getting over initial difficulties to do with access and so on. Part of our job is to encourage businesses to look beyond any short-term issues and to give disabled people an equal chance. In Wiltshire we are very lucky to have low unemployment, but some people still struggle to get jobs due to disability. We are doing everything we can to help people back into work. It's good for them, and also good for organisations which struggle to fill their vacancies. One of our challenges is to help people who have been out of work for a long time find their way into a job. That can include people with disabilities, and the message today is that employers are keen to talk to potential recruits regardless of disability. They need staff, and disabled people like many of those people attending today need work. So let's put them together. There is a disparity between the numbers of able-bodied and disabled people in jobs. The figures are horrifying. It is our mission to do something about that, and every time we place a person with a disability in a job I say, ‘Hallelujah!' Because that means a person who might have been falling short of their potential is in work, getting a boost in self-esteem, earning money and paying taxes. It changes people's lives. There is a job for everyone, regardless of disability, and today is a wonderful event because we are surrounded by employers with vacancies to fill this very day. We are here for a simple reason. Good employers need good employees, and disability doesn't affect that. We are in immediate need of 3,000 engineers across the country. We have jobs that need filling today. It's true that many of our jobs require a high degree of physical activity our engineers climb poles and work at height. But there are opportunities for everyone. We had a vacancy for a time-served mechanic, and a guy with one arm applied. He got the job, he is brilliant, and we are so pleased to have him. Careers advisers also attended the fair to offer free CV health checks. Wiltshire Council takes part in the government's Disability Confident scheme, which encourages employers to recruit and retain more people who have a disability.